A Basic Introduction to Qi Gong - The China Taichi Guide is a Directory of Tai Chi Schools & Tai Chi Teachers in China. The Chinese Traditions of working with Qi, (Consciousness Energy) go back far into the past, thousands of years perhaps and evolved as part of the Taoist Spiritual Tradition, long before Tai Chi was conceived. In my understanding the term Qi Gong is a fairly modern one, created to describe all of the internal energy arts of China, even Tai Chi, but in practice, the use of the word among Western people often resembles the traditional category of Wei Gong. Wei Gong means external movement, and as a practice it means cultivating and gaining control of the Qi using external movements of the body, especially the arms and hands. Exercises often involve standing in one spot, although some also involve movement of the lower body. Nei Gong, in contrast, means internal movement, and involves working the Qi, using more subtle inner movements of the dantien, abdomen. It may also involve the use of the imagination and intention to move the Qi through the merideans and organs. Some Qi Gong systems may start off in a Wei Gong fashion and then progress on to deeper levels of Nei Gong as the student develops. 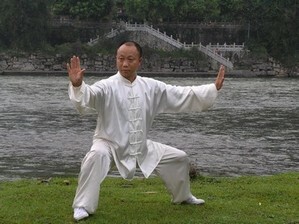 The Zhan Zhuang exercises used by Yiquan could also be considered a form of health Qi Gong. Generally it is not straightforward to find teachers of these arts in China, as they are not taught publically in the way that Tai Chi is. Possible locations might be in some of the Universities such as Beijing or Chengdu for Medical Qi Gong systems. There is also a Canadian teacher providing Qi Gong instruction at a yoga school in Yangshuo with a wide background of experience. Spontaneous Qi Gong might also come under the Qi Gong umbrella. There is a tradition called Ziran Men (The Natural Way) with its main lineage teacher, Master Zhang, living in Chengdu. I only know a little about it, as the main contact with the West so far, seems to have been in Germany, but it sounds really interesting and combines aspects of the Martial arts with Nei gong, Taoism and Buddhism. Master Zhang is also a Chinese Medicine Doctor and so this could make a great health trip for someone. He's taught in Germany as well for the last few years. Spontaneous Qi Gong involves training yourself to loosen the grip of the conceptual mind on the body, so allowing the second brain, the dan tian, to activate and initiate movement or even make sound. The intelligence of this second mind, goes far beyond our little conceptual one, and it will work to bring the body and mind into balance. I personally practice similiar work from the Japanese Hara tradition and it is very special, but takes some getting used to in the beginning, as their is a lot of fear involved in 'letting go' and 'being real' for a while, which are the basic requirements for this art, as well as having a high degree of development in Qi Gong and meditation. A good teacher is essential. I would be very interested to hear from anyone who visits Master Zhang as I haven't got round to doing so myself yet. The China Taichi Guide : A Basic Introduction to Qi Gong.